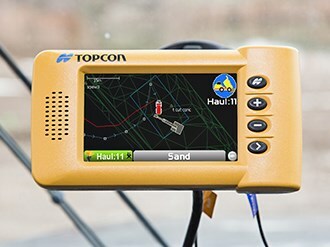 The Topcon HT-30 automates haul counting and allows the real-time management and tracking of material payloads across a project via a small, portable, GPS-enabled control box that mounts into haul truck cabs. The Topcon HT-30 real-time haul count system. As the truck is loaded, data including material type, driver details and load quantity is input into the system. The load is then integrated into Topcon’s remote site management interface, SiteLink3D, where engineers and construction managers can track each load in real time for scheduling, rerouting and delivery recording. "Topcon’s HT-30 system eliminates the need for manual counting and paper-based haul progress reporting," says Joel Seddon, Machine Control Product Manager at Position Partners, Topcon’s Australian distributor. "Engineers have live haul information delivered straight to the office in real time, allowing them to monitor progress more efficiently and make proactive decisions." Topcon HT-30 has a bright, full-colour screen and simple one-button operation to record new a new load or report a delivery. Operators can view a map to see where they are on site, check cycle times and average distances or time of hauls. Haul truck operators and engineers can send and receive messages to one another using the in-cab control box and Topcon SiteLink3D office software. "Traditionally engineers and construction managers don’t know what material has been moved and where until the data is manually entered at the end of the day or week," Seddon says. "By removing the two-step process of manual recording by the operator and manual data entry in the office, they know if the project is on track, running behind or ahead of schedule. "Real time data eliminates human error and enables better planning," he adds. The Topcon HT-30 system can be used as a standalone haul solution with SiteLink3D. Alternatively, haul reporting can be integrated with DynaRoad scheduling software for seamless project reporting and planning.